Thanks to Purdue University, you can now blow up the Earth from your desk. You can pick the spots you want to destroy, you can determine how big the disaster becomes. You can even choose the means of destruction: Tsunami? Airblast? Seismic event? If all this sounds unpleasant, don't worry. It's actually fun, promises Jay Melosh, a professor of Earth and atmospheric sciences at Purdue and the developer of the planet destruction technology; it can even be used by kids in kindergarten. Happily for the planet  to say nothing of Melosh's tenure status  the new system does not blow up the honest-to-goodness Earth. It does, however, blow up a simulated Earth on a user-friendly website, relying on incoming asteroids as the agents of destruction. By selecting the characteristics of the cosmic boulder  size, speed, density, angle of approach and more  you can shape the damage they do. That's more than just good, clean, morbid entertainment. In addition to teaching students about the physics and history of asteroid collisions, the website, called Impact: Earth! is also being used by both NASA and the Department of Homeland Security to study what could one day be an all-too-real impact scenario. The solar system has always been something of a shooting gallery  more so in its earliest days, when the cloud of dust and debris that was all we once were hadn't yet been swept up into planets and moons. It's still a dangerous cosmos out there, and the Earth gets beaned all the time  with about 100 tons of detritus from comets and asteroids hitting us each day. The overwhelming share of the material  including chunks of rock as big as a car  will incinerate in the atmosphere well before hitting the ground, but about once every 100 years or so, something significant gets through. That's scary, because it takes only a small rock  at least relative to the size of the Earth  to do a lot of damage. On June 30, 1908, an asteroid estimated at 120 ft. (37 m) plunged through the skies over the Tunguska River in Siberia, detonated at an altitude of 28,000 ft. (8,500 m) and released a blast of energy 185 more powerful than the atomic bomb that destroyed Hiroshima. The mile-wide Barringer Crater in the Arizona desert is thought to have been caused by a 164-ft. (50 m) asteroid that struck the Earth 50,000 years ago. The dinosaurs were wiped out courtesy of a 9-mi. wide (14 km) monster that arrived 65 million years back. Message: Be afraid  really. Since 1995, NASA's Jet Propulsion Laboratory (JPL) has been taking the asteroid threat seriousy, tracking near-Earth asteroids with the help of the Palomar Observatory at the California Institute of Technology. While JPL sends out a lot of alerts, they have all  so far  been followed by all-clears. Last April, an asteroid prosaically named 2010 GA6 zipped by us at a distance of 270,000 miles  about 30,000 miles farther than the moon. Just three months earlier, another object buzzed us at an uncomfortably close 76,000 miles. But so far, we've dodged any meaningful bullets. To keep things that way, the Impact: Earth! 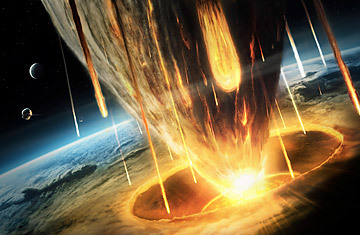 program has been made available not just to Homeland Security and NASA, but to the Air Force, the U.S. Geological Survey and numerous foreign governments, the better to help them plan for post-disaster scenarios and explore technologies to deflect incoming in asteroids. Those deflection methods would include using unmanned spacecraft to nudge an asteroid onto a different course or explosives to blast it into smaller bits. In 2008, the Air Force issued a 107-pg. report that took all this up in detail, addressing such issues as when to notify the President of an impending asteroid strike, how to evacuate threatened cities and what to do if backyard stargazers with good telescopes spot the danger before the professionals do  a very real possibility that could spark a panic if the amateur astronomers then jumped on the Internet with the news. The authors of the report based their findings on a mythical hit by a mythical 270-ft. asteroid  wonderfully named "2008 Innoculatus"  landing somewhere in the Gulf of Guinea. They did not predict pretty results. Studies of this kind are made more precise and less academic when such x-factors of the impact as kilotons of energy and radius of debris field can be quantified, and that's the void the Purdue website aims to fill. "The calculator is a critical tool for determining the potential consequences of an impact," says the equally well-named John Spray, director of the planetary and space science center at Canada's University of New Brunswick. "It is widely used by government and scientific agencies as well as impact research groups and space enthusiasts around the world." It's that last group of people  the enthusiasts  who get the best of the website. Blowing up the planet can be, well, fun  but only when you don't have to think about how you'd clean up the mess.